Our quaint coastal community of Scituate, Massachusetts, is one of the oldest towns in the United States. It is located 28 miles south of Boston with a population of 19,401 residents. Scituate’s first settlers, at the encouragement of “merchant adventurer” Timothy Hatherly, came to Scituate in about 1628. These settlers were known as the Puritan ”Men of Kent” from England and were drawn to Scituate by its unique, rich geography and a promise of prosperity. Devoted to their faith, and determined to flee persecution in England, they soon built the original First Parish Church of Scituate on Meeting House Lane. Years later, in 1790, minister convert, Reverend John Thayer, was the first Catholic priest to visit Scituate. He also was the first New Englander to be ordained a priest. Then, in April 1798, Father John Cheverus (later consecrated the first Bishop of Boston in 1810) visited Scituate after a trip to the “Southern Mission of Boston” in Plymouth. While in Scituate, according to his records, “He baptized in the family of one Michael Clapp, the only Catholic family in the town.” Reaching out to the various Catholic families of the South Shore, Father Cheverus brought books containing instructions for practicing their faith at home. They would still have to travel to Boston for Mass and the sacraments. As the “Men of Kent” before them, Irish Catholic fishing partners, Daniel Ward and Miles O’Brien and their families, came to Scituate in1847 with the hope of a prosperous fishing career in one of Massachusetts’ finest fishing grounds. Daniel Ward soon would have a tremendous religious and historical impact on this small town. The Ward and O’Brien families began an Irish Catholic colony, the first colony of Catholics in any significant number, and initiated the town’s lucrative mossing industry. Ward had discovered a species of marine algae on Scituate’s coastline he identified as “Irish Moss,” or carrageen. Familiar with its market potential in Ireland, he encouraged the colony to gather the moss and prepare it for sale as an emulsifier to be used in chocolate milk, toothpaste, mayonnaise, cosmetics and other items. It provided commercial stability for this Catholic colony. Finally in 1848 and 1850, respectively, Quincy and Randolph became parishes. Now, Scituate Catholics could travel to these towns for baptisms and marriages instead of making the arduous journey to Boston. However, when serious illness arose and death seemed imminent, priests would travel to Scituate to administer last rites. At last, in 1848, Daniel Ward’s large home, the first house built on First Cliff in Scituate, was completed. He offered up his home, fondly referred to as the “Big House,” for the Catholic community’s first Mass. Father Sullivan of Boston was the celebrant and Father Gallagher of Boston was his assistant. Beginning in 1856, Randolph Pastor Reverend Aaron Roche came to the “Big House” to celebrate Mass for the Scituate Catholic community. He was here four times a year, for a two-day stay each visit, until his death in 1869. Sadly, Miles O’Brien died in 1851. He was the first Catholic prepared for death in Scituate and was buried in Quincy. The first Catholic buried in Scituate was John O’Reilly, in 1851, in the Union Cemetery. The first Catholic child born in Scituate was John F. Murphy, son of Patrick and Mary (Kane) Murphy, on August 8 1852. The first Catholic child baptized in Scituate after the establishment of the Irish Colony was Mary Ellen Duffy. She was baptized in 1855 by Father Sullivan of Boston. And finally, the first Catholic couple married in Scituate was Patrick Driscoll and Mary Gaynor, on August 30, 1858, by Father Roche at Cornelius Doherty’s home. Cornelius Doherty offered his house and barn on Second Cliff in Scituate for Mass and Sunday school. The vestments remained at the “Big House”. However, as the number of Catholics increased, no house was large enough for the community’s Catholic services. In 1869 Reverend Hugh P. Smyth, commonly known as the “Builder of Churches,” became pastor of Weymouth, with his missions of Hingham, Cohasset and Scituate. Mass and Sunday school were now held in the second floor hall of Paley Allen’s Grocery Store on Front Street in Scituate. Father Smyth soon proposed building a church on part of the cemetery grounds on Meeting House Lane. Work on the church began in the summer of 1872. Joyfully, the first Mass was celebrated in the basement of this new church on Christmas Day 1872. Appropriately, the church was dedicated “Church of the Nativity.” It was also affectionately known as the “Church of the Mossers”, as the funds garnered by the success of the Scituate mossing industry helped to “build” the church. 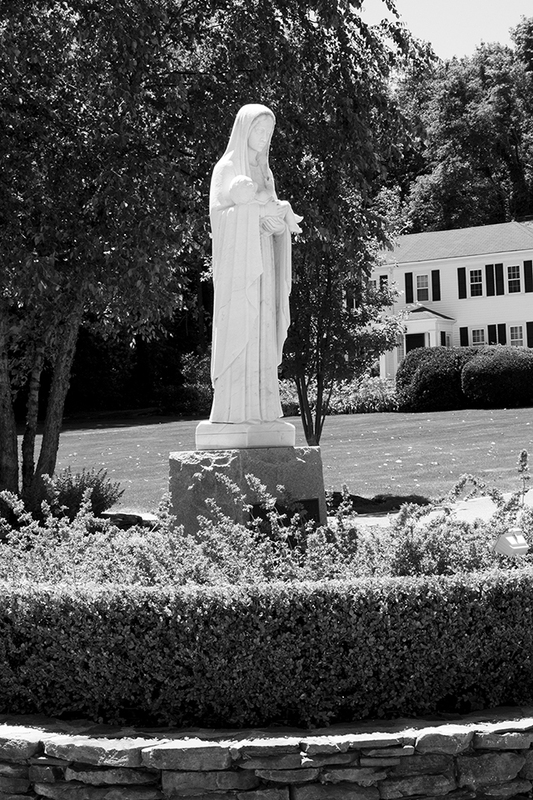 Although Scituate now had its own Catholic church, it remained a mission for 59 more years. Father Fagan, Pastor of St. Paul’s Parish in Hingham, came every other week beginning in 1880 to celebrate Mass in St. Mary’s still unfinished upper church. He continued the work on the upper church, having a marble altar placed there, and carpeted the altar floor. Through the diligent efforts of the priest and parishioners, and with the proceeds from a fair held in July 1889, the upper church was adorned with new pews, Stations, and gas lights. Beginning in July 1897, two Masses were celebrated every Sunday. Soon the Chapel of St. Mary of the Annunciation was built on land purchased by a group of summer Catholic Families led by William A. Palmer, and with the help of Father McDonough, Pastor of Cohasset. The Chapel’s first Mass was held on July 5, 1903. Then, in 1916, the summer mission, Chapel of St. Mary of the Visitation was built in Sand Hills due to an increase in Scituate’s summer colony. At long last, on July 5, 1921, Scituate was made a parish, which included Marshfield and Norwell. The Rev. Patrick J. Buckley was its first pastor. The next year, Father Buckley purchased the Ward estate on Front Street for the first rectory. Then, in 1927, Humarock’s summer mission, the Chapel of the Flower was built. Father Buckley was transferred to St. Patrick’s Church in Cambridge in 1931. He had made many meaningful contributions to St. Mary’s parish and his parishioners treasured him. His Successor was the Rev. Thomas A. Quinlan. Father Quinlan purchased the Williams Estate and converted its house to the present rectory. Unfortunately, the St. Mary of the Nativity Church on Meeting House Lane was destroyed by fire. Hence, during Father Quinlan’s leadership, our present church, with the Chapel of the Infant Saviour, was constructed on Kent Street. It was dedicated on August 1, 1937. Marshfield and Norwell, too, became separate parish entities. To honor the many accomplishments of Father Quinlan, His Excellency, Archbishop Richard J. Cushing attended his golden jubilee at Dreamwold Hall in Scituate on April 27, 1947. His Excellency the Archbishop recommended that the Holy Father, Pope Pius XII, elevate Father Quinlan to the rank of domestic prelate, making him the Right Reverend Monsignor Quinlan. And on Sunday, December 21, 1947, his Excellency Archbishop Richard J. Cushing celebrated a Pontifical High Mass in honor of the 100th anniversary of the first Catholic colony and their first Mass in Scituate, the Diamond Jubilee of the first Mass in St. Mary of the Nativity Church and the Golden Jubilee of Monsignor Quinlan’s ordination to the priesthood. The celebration was a wonderful tribute to the accomplishments of the Scituate Catholic Community. Since Scituate became an independent parish in 1921, it has had six Pastors: Reverend Patrick J. Buckley (1921-1931); Right Reverend Monsignor Thomas A. Quinlan (1931-1954); Reverend Edward Sullivan (1954-1973); Reverend Joseph G. Deacon (1973-1986); Reverend Monsignor Eugene P. McNamara (1986-2003); Reverend Brian Manning (2003-2009), and Reverend Kenneth V. Cannon (2009-Present). Each of these pastors has made noteworthy contributions to the Scituate Catholic and Larger community. During Father Sullivan’s stewardship, the St. Mary’s Hall was built by the Knights of Columbus, and Reverend Joseph G. Deacon labored for two years to make the new St. Mary’s Cemetery a reality. Monsignor McNamara envisioned and began the task of building a new Parish Center to accommodate the growth of the catholic community. Rev. Brian Manning completed the project and the Parish Center was dedicated in 2003. St. Mary of the Nativity Church is not simply a structure, but a vibrant and living community of faith. It is a testament to a faithful parish community whose efforts and strong desire make St. Mary’s a beautiful and unique place to gather in worship.